1. 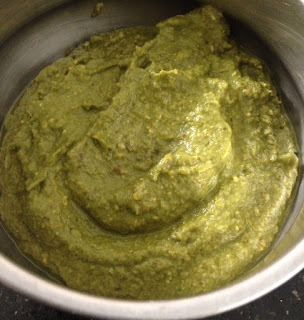 Grind together coriander leaves, mint leaves, four green chillies to a fine paste. 2. Add lemon juice and salt taste. 3. Separately grind together ginger, garlic and two green chillies to a fine paste for the batter. 4. In a bowl mix besan, cornflour, baking powder, turmeric powder, crushed red chillies, ginger-garlic-green chilli paste and salt. Add lemon juice and oil and mix. 5. Add a little water to make a thick batter. 6. Spread the green chutney on either side of the paneer squares. Stick capsicum squares on both sides of the paneer square. In a bowl mix chaat masala and red chilli powder. 7. Heat sufficient oil in a kadai. Dip the sandwiched paneer pieces in the batter and deep fry till golden. 8. Drain the pakoras and place them on an absorbent paper. Cut into two halves. 9. Place on a serving plate. Sprinkle the dry masala and serve hot.